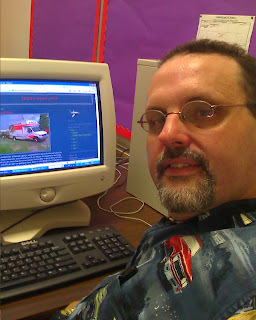 Treb's Blog Stop: Back to the ol' salt mine ~or~ Am I smarter than a 5th grader? Back to the ol' salt mine ~or~ Am I smarter than a 5th grader? Actually I am excited to get back to work this summer. We have had a great vacation season, and it is time to get back to work and earn our living. This year I am going to be at the 5th and 6th grade level after 11 years K-2. Last year I did do some limited 4th grade along with my K-2. This year it is mostly 5th and 6th with limited K-2 so I haven't left RVT altogether. GOOD THING TOO! I bought 14 of those RVT shirts... I gotta have a reason to wear them! R.V. Traylor Elementary is like home but I guess I am going to have to expand that idea to include Central Elementary. Its fine, I am excited to get started. I have the opportunity to work with some students that I haven't seen in a few years and keep them moving forward. It's going to be a good year! Once again I am in the same building as Patti Jo. She is the secretary at Central. She has been at it for about a month and has hit the ground running!!! She is doing a bang up job and is well received among the teachers and staff. I will miss my lunch bunch at RVT, but they all moved away anyway. However with Patti here I may be able to sneak in a lunch with her occasionally, and that is always good. 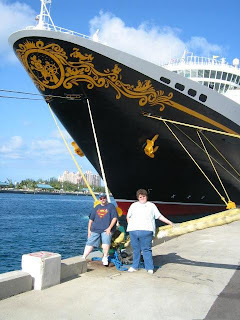 Here is a picture of me and Patti last summer when we were in Nassau on the Disney Cruise.